Many decades before fully developing the exquisite mental illness that would later contribute to the uncanny and iconic performances he gave as Frank Booth in David Lynch’s Blue Velvet (1986) and Feck in The River’s Edge (1986), Dennis Hopper played in a variety of Hollywood and Indy cult films. 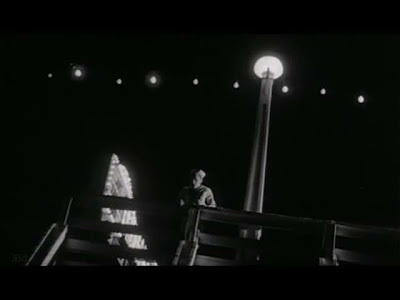 Some of these films are somewhat forgotten (and rightfully so) while others – like Curtis Harrington’s Night Tide (1961) – are thankfully not. 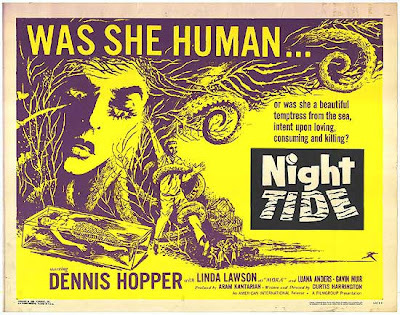 Night Tide is a fantastic little cult item about a young navy sailor named Johnny Drake (played by a relatively mentally stable Dennis Hopper) who finds himself magnetized to the mysterious pheromones of a cutesy fishy lady named Mora who may or may not be a genuine mermaid. During the film, the audience learns that Mora was found as a child on a Greek Island and adopted by a British sea captain named Samuel Murdock (played by Gavin Muir); a somewhat shifty Svengali man-of-the-world who makes Johnny seem like a boyish philistine. Marjorie Elizabeth Cameron – the Occultist wife of fellow Thelemite and rock scientist Jack Whiteside Parsons and star of Kenneth Anger's color short Inauguration of the Pleasure Dome (1954) – also plays a small but imperative typecast role in Night Tide as a mystery sea-witch who seems to hold psychic powers over Mora. Apparently, Parsons' thought his wife Marjorie was an incarnation of the goddess Babalon (who she played in Inauguration of the Pleasure Dome), thus her ghastly yet angelic appearance in Night Tide only makes the film seem all the more eerie. 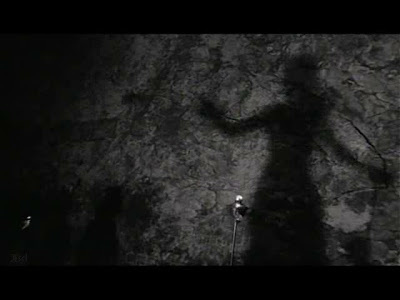 Night Tide director Curtis Harrington also directed the documentary The Wormwood Star; a work about Marjorie Cameron and her Magickal art. In a sense, the audience is in the same rocking boat as Hopper’s character Johnny as both he and the viewers are bewildered by the dubious motives of Mora and the mystery woman follows her throughout the entirety of Night Tide. 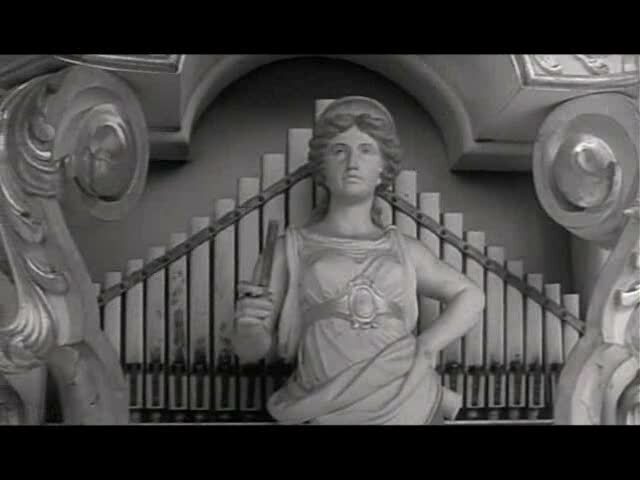 Essentially, Night Tide is a Gothic haunted house flick without a ghost-ridden house but, instead, set in a strangely atmospheric beachside vacation spot that can be justly compared to Herk Harvey’s Cocteau-inspired cult masterpiece Carnival of Souls (1962). 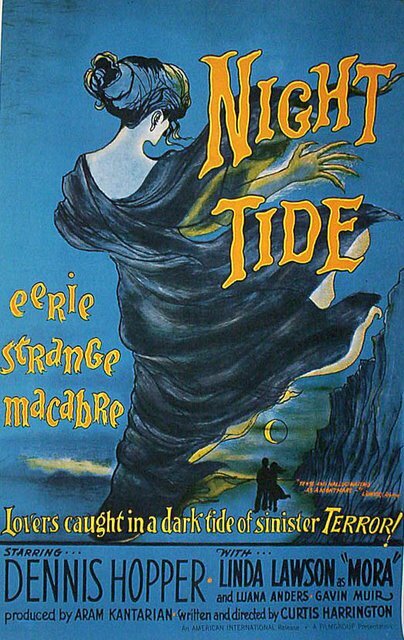 Curtis Harrington – being a lifelong Edgar Allan Poe fanatic (his first film was a short 8mm adaptation of The Fall of the House of Usher) – named Night Tide after a line from Poe’s popular poem Annabel Lee. At the conclusion of the film, it will be all the more apparent to the viewer as to why the title of Night Tide and its source are all the more fitting. 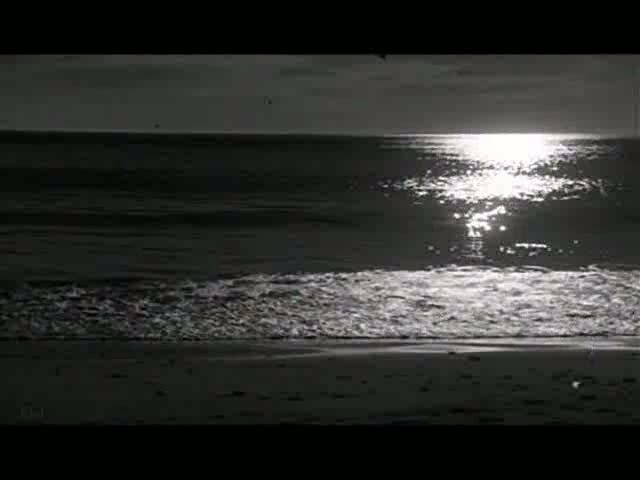 I must admit that I have some domestic prejudices in regards to my reverence of Night Tide as I live in a seaside habitat similar to the one featured in the film. In fact, I only have to walk about 30 seconds from my condo to reach the beach and the Atlantic Ocean. Like the small beach town featured in Night Tide, my local area is known for its various amusement parks and Oceanside boardwalk. Of course, the only thing scary about my area is the number of extremely unpredictable alcohol-addicted locals and the unneeded number of aggressive police that arrest them. My town also has a relatively popular vintage boardwalk haunted house ride that features the same sort of Gothic horror cheese atmosphere that Night Tide potently permeates. On top of featuring a number of scenes of Johnny strolling down the beach and boardwalk amongst midnight shadows in the hopes of tracking down his ghostly gal, Night Tide also includes a couple phantasmagorical dream-sequences composed of Ed Wood-esque sea-urchins which are quite similar to the ones that can be seen at my local haunted house ride. Simply put, Night Tide is one of those rare Gothic horror B-movies that one could describe as an example of, “they don’t make them like they used to.” The same can be said of counter-culture acting legend Dennis Hopper; one of the few actors in American film history who deserves to be described as a true veteran actor due to his notoriously volatile personal life and uneven and unpredictable acting career. Although Hopper seems seemingly sane in Night Tide; his infamous nervous stoner laugh is still quite noticeable in the film. Night Tide also features some elements that foretell the awakening of the popular hippie movement in American, including a lucid New Age-ish bongo dance performed by the thoroughly entranced Mora, an irrational tribe of drug-possessed youths, and a bombardment of degenerate Jazz. Hopper’s character Johnny is also the sort of emasculated male that is incapable of taming his dominant beastess; a revolting trait oh-so in post-hippie American. Beautiful review of a beautiful film. They really don't make 'em like this anymore! You've captured the essence of this fine film. I'm fascinated now by your Atlantic location. "Various amusement parks"? Not just one? I must visit some time. I love this film. It was actually one of the reasons I started "Shades of Gray," my blog focused entirely on black-and-white films, comic books, and art. I actually thought "Carnival of Souls" was a better film than "Night Tide". Imagine being the Dennis Hopper character in a similar seaside town and encountering a mermaid that looked like Heather O`Rourke, talk about being in heaven ! ! !. I cant believe its already 18 months since Dennis Hopper snuffed it. James: Thanks! I see you have quite the collection of passionate film reviews on your blog as well. Phantom: Indeed, we have two amusement parks on the boardwalk; one at the inlet (which is at least 50+ years old) and another on the main pier. There used to be another amusement park on the pier (with an old school haunted school where masked monsters would follow you) but it unfortunately burned down about 20+ years ago. There is also another amusement park in the downtown part of OC as well. Steven: Thanks, you have a great collection of nostalgic film reviews as well!